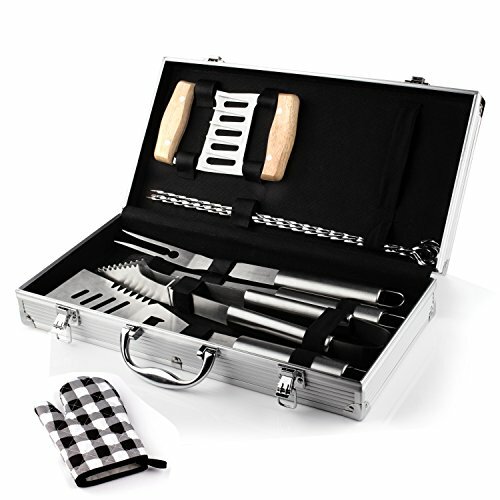 ✔PREMIUM STAINLESS STEEL Tools &ALUMINUM STORAGE CASE：Made with top quality stainless steel and well polish finished, durable, easy to clean.BBQ grill accessories come with a delicate aluminum case for ease of storage, and the case is lightweight to carry around. ✔LOND-HANDLES &ANTI-SLIP SPECIAL DESIGN-Deluxe stainless steel grill sets long-handled spatula and tongs allow you to manage hefty meats, even at the back corners of extra-large grills, without singing your skin or hair. The 4 skewers is spiral without turning around at the barbecue.Also all tools have a loop for hanging except claws&heat resistant and water resistant gloves. ✔PERFECT GRILLER GIFT- This grilling accessories tool kit is the perfect gift for Wedding, Birthday, or Father\'s Day for the aspiring grill masters who also require the proper tools to produce the finest meals. ✔WARRANTY：Our main purpose as a seller is to provide the best products, customer service and bring an excellent shopping experience to every customer. If you are not satisfied with our product, just Contact us! Contact us! Contact us!The important thing should be said three times!